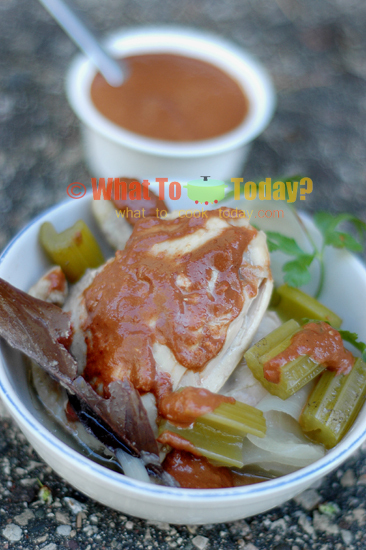 One of the things that really intrigued me into trying this chicken mole is the usage of chocolate in the sauce. After over 556 recipes I’ve been cooking, this is the 557th, we’re family who is dare to try just about any food on earth. I’ve always eaten chocolate as part of sweet treat. To use chocolate in cooking was kinda new to me though. I’ve tried spicy chocolate brought by colleague from Korea before, and as weird as it sounds, it was really delicious. When I saw the ingredients used in the chocolate mole sauce for this recipe in Jamie’s America cookbook by Jaime Oliver: dried red chilis, cocoa powder, chocolate, onions, tomatoes, sesame seeds, etc…. that immediately scored some points on my to-cook list. 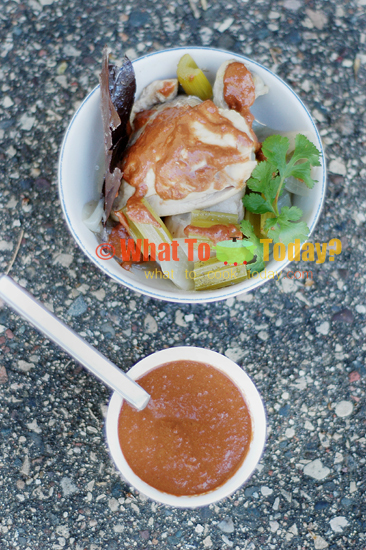 Mole (pronounced mo-lay) sauce is used in Mexican cuisine. The word Mole itself refer to “sauce” in general. Even with many varieties of mole sauces out there, the preparation of mole is often begins with some type of chili pepper and chocolate is often added in the end of cooking to bring all the flavors together and give it a rich thickness. A good mole sauce should be sweet, spicy, silky smooth, and a pleasure to dip any bit of lucky old meat into. This chocolate mole sauce not only works with chicken,but also great with pork, beef, lamb, or roasted fish.